Initially, you will have to build your routine around your puppy’s needs, and these are reliably predictable when they are very young. Puppies need to urinate immediately after waking up, so you need to be there to take your puppy straight into the garden without any delay. You may find it useful to keep a record of when your puppy eats sleeps, urinates and defecates. A simple diary list will do. Repeat cue words like ‘wee wees’ and ‘poo poos’ or ‘be busy’ and ‘be clean’ while the puppy is actually urinating or defecating. Use different words for each action so that you will be able to prompt the puppy later on. Always go with your puppy into the garden so you are there to reward and attach the cue words to the successful actions! 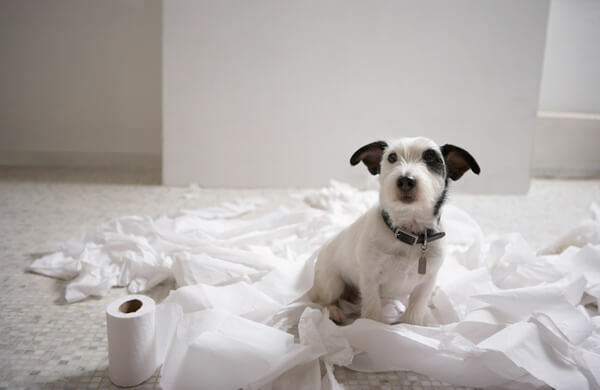 Fortunately, puppies are creatures of habit, so as long as you introduce the garden to your puppy as its toilet area early on, you should be able to avoid most of the common pitfalls. Feeding an unsuitable diet or giving a variety of foods. Not feeding at regular times. Using ammonia based cleaning compounds (which smell similar to urine). Expecting the puppy to tell you when it needs to go out; this is unrealistic, so it is better to take them out at regular intervals. Leaving the puppy alone in the garden, so you are not there to reward it for going outdoors… how is it meant to learn that it is more popular and advantageous going outdoors, if you are not there to show your approval? It is unfair to expect your puppy to go right through the night when it is very young. To break this habit, you will have to get up very early one morning (when you have plenty of time), and get your puppy out on a walk before it has had its morning wee. You should not bring it home until it has been forced to go out of desperation. If however, you are unsuccessful, and your puppy has not toileted, then take it immediately into the garden on your return, or you risk it relieving itself indoors.